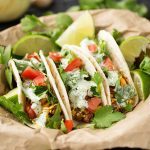 Turkey Street Tacos with Cilantro Cream Sauce are made with ground turkey and a fantastic sauce featuring fresh cilantro. They were aptly named because when you lifted the taco to your mouth, a rivulet of grease, or “drippings” as we now call them, would spill down onto your waiting clean blouse. If you were lucky, some of it would land on your plate. No matter, they were delicious! Mom always made sure we had all the fixins’, like grated cheese, onion, tomato, and lettuce. Oh, and the shells were supposed to be crunchy, but a swim in mom’s hot oil just wasn’t enough to coax them into crunchy compliance! I’ve never tried to replicate those tacos of my childhood. They will remain steadfast in my childhood memories. Now, on to Turkey Street Tacos with Cilantro Cream Sauce! Fast forward a couple of decades or so. I’ve been happily making my own versions of tacos for years, and have yet to find a favorite. I will say, these Turkey Street Tacos with Cilantro Cream Sauce are amazing! 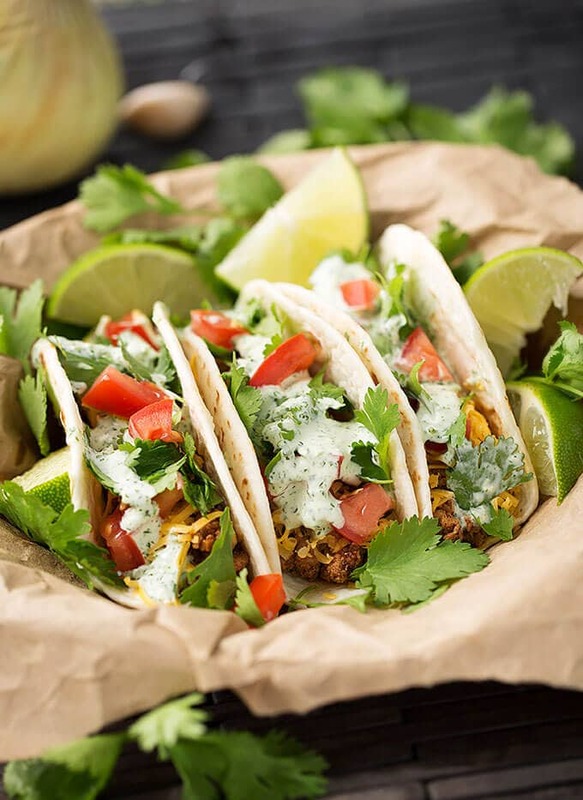 These little tacos may be small, but they pack a punch of flavor. Don’t let the words “Ground Turkey” scare you either. The meat is seasoned nicely, and just enough to play nicely with the cilantro cream sauce. Speaking of the sauce, I always make a double batch because if I don’t, I miss it when it’s gone. Cilantro Cream Sauce goes on so many things: My Southwest Quinoa Bowl, scrambled eggs, gyros, burritos, salads, veggies, chips, a spoon… Just saying, this stuff is good! 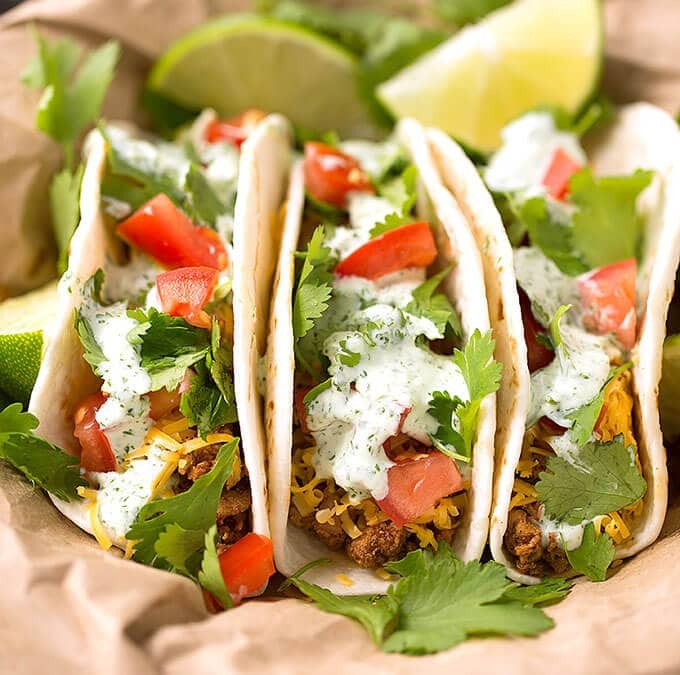 These little tacos may be small, but they pack a punch of flavor. Don’t let the words “Ground Turkey” scare you either. The meat is seasoned simply, and just enough to play nicely with the cilantro cream sauce. Add all ingredients to a mini food processor (or use a full sized one if that's what you have) and blend very well. Taste and adjust amount of cilantro and/or salt to your liking. I like a strong cilantro flavor, and usually know it's ready when the sauce turns a pale tint of green. Heat a skillet to med high and add the olive oil. When it starts to shimmer, add the diced onion. Stir occasionally, until softened. Add the ground turkey, breaking it up as you cook it. Add the garlic, cumin, chili powder, salt, and pepper. Stir well. Cook until the meat is cooked through, and add the tomato paste. Cook it just a couple minutes longer to heat the tomato paste through. 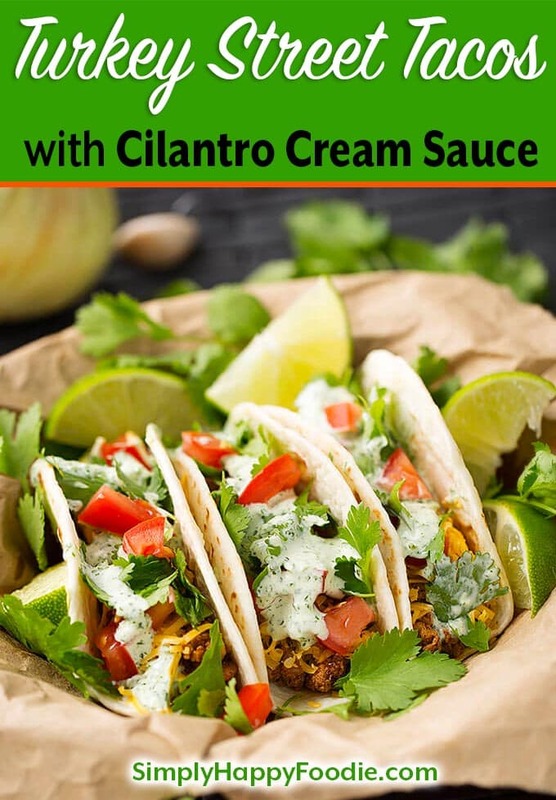 Assemble your tacos with the cheese, then meat, diced tomatoes, and drizzle on some of the Cilantro Cream Sauce. Enjoy! You can use Ground Beef if you prefer. For Ground Turkey, I don't recommend extra lean.